I recently started a series of postings from my tour of presentations in Europe and the UK. 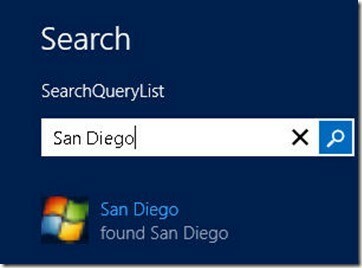 Today I’d like to return to Searching (which I started to cover here), and this time take a look at what it takes to have your application offer Search suggestions as the user types into the Search box. To examine this, we’ll create a Windows 8 application with the suggestions hard coded, but you can just as easily obtain the suggestions from a web service, or database, etc. Once again what I’m going to do is strip down one of the Microsoft SDK examples and then build it up from scratch. You can find the original sample by clicking on Help->Samples in Visual Studio. The one you want is Search Contract. 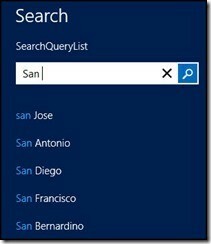 To begin, create a new Blank application in Visual Studio and call it SearchQueryList. The very first thing to do is to double-click on PackageAppxManifest and then click on the Declarations tab. 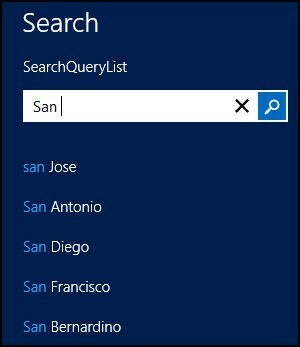 Choose Search from the available declarations and add it to the project. 6:         // navigate to landing page. All the interesting work happens in the code behind for MainPage. We begin by defining a static reference to MainPage itself, along with a private member of type SearchPane. 22:         "Toronto", "Montreal", "Vancouver", "Ottawa-Gatineau", "Calgary", "Edmonton", "Quebec City", "Winnipeg", "Hamilton"
Let’s take this method apart, step by step. You can see what this looks like in the figure at the top of this article. 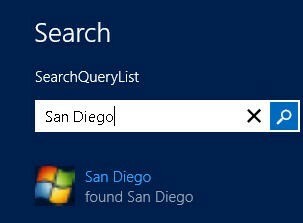 Once again, Windows is doing all the heavy lifting of obtaining the query and creating the suggestion list; all we have to do is to find the matching values and add them to the SearchSuggestionCollection in response to the SuggestionsRequested event. This entry was posted in Data, Essentials, Metro, Mini-Tutorial, Windows 8, WinRT and tagged Mini-Tutorial. Bookmark the permalink. Tremendous issues here. I’m very happy to peer your article. Thanks so much and I am taking a look forward to touch you. Will you kindly drop me a e-mail? Hello, i believe that i saw you visited my blog thus i came to return the prefer? .I am attempting to in finding things to enhance my site! you’re really a just right webmaster. The website loading speed is amazing. It seems that you’re doing any unique trick. Also, The contents are masterwork. you’ve performed a great process in this matter! Extremely helpful information particularly the last section 🙂 I deal with such information a lot.